PORTLAND, Ore. – Lee Nguyen called it a lucky bounce. His rebound goal in the 85th minute pulled the New England Revolution into a 1-1 draw with the Portland Timbers on Sunday night. Nguyen’s third goal of the season was the first ever for New England at Providence Park. It also gave the revitalized Revolution an important point on the road. “I just had a lucky bounce and I was able to pounce on it,” Nguyen said. After a pair of losses to open the season, New England was coming off a confidence-boosting 5-2 victory at home over the expansion Minnesota United. Juan Agudelo scored a pair of goals to win MLS Player of the Week honors. Nguyen said the momentum carried over to Portland. Diego Valeri scored his fifth goal of the year early in the opening half to give Portland a lead that lasted until Nguyen scored. 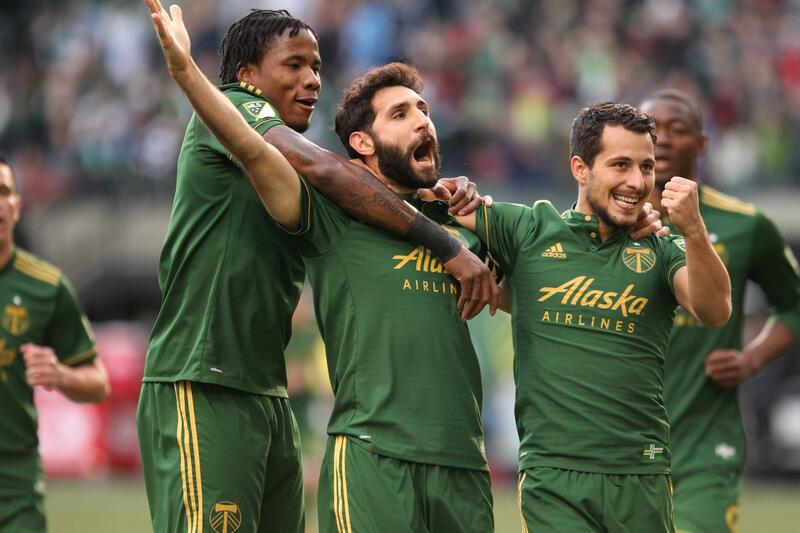 The Timbers had won three of their first four matches of the season going into the game. They lead the league with 13 goals overall. Valeri scored on the volley in the 12th minute, eluding leaping New England goalkeeper Cody Cropper. After the goal, Valeri pumped his fist for the Timbers Army supporters’ section before kissing the crest on his jersey. Valeri was side-tackled in the 25th minute by Xavier Kouassi and was prone on the field for several minutes but returned. Kouassi was handed a yellow card in the final minute of the first half for a foul on David Guzman. New England’s Kelyn Rowe was issued a yellow card because of a foul on Marco Farfan early in the second half. The Revolution are opening the season with five straight matches against Western Conference teams. New England’s game against the Orlando Pride on March 11 in Foxborough was postponed because of weather until Sept. 2. After wins in its first three matches, Portland dropped a match at Columbus last Saturday. It was one of just three matches last weekend because of international play. The Timbers had two players on international duty: Darlington Nagbe with the U.S. national team and Guzman with Costa Rica. Portland was without injured defenders Liam Ridgewell (foot) and Vytas Andriuskevicius (calf). Both were missing their fourth straight game. The Revolution lost rookie defender Josh Smith in the final moments of the game with what appeared to be a right leg injury. Later coach Jay Heaps said Smith had a cramp, but he also dislocated his thumb. Timbers forward Fanendo Adi still needs one more goal to pass John Bain as the franchise’s all-time leading scorer. Bain scored 45 goals for the Timbers from 1978-82, when the team was part of the North American Soccer League. Smith, who was making his MLS debut, battled Adi the entire game. Smith was the fourth overall pick in this year’s MLS SuperDraft out of San Francisco. Published: April 2, 2017, 10:15 p.m.